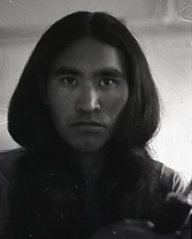 The promising career of the Northwest Territories’ first Dene professional photographer came to an abrupt end on November 17, 1979. Jim Jerome was only 30 years old when his Inuvik house burned and he lost his life. Jim Jerome was born in Aklavik (see map) on July 31, 1949 and raised in a nearby traditional Gwich’in camp called Nichìitsìi diniinlee (Big Rock). He attended residential school in Inuvik and later attained a Northwest Territories welding certificate. As a welder he was able to travel widely and could begin to afford the high cost of his true passion, photography. At the age of twelve, when Jim was given a ‘Brownie’ box camera, he began photographing his environment and his people. By the time he reached his mid-20s he could afford quality photographic equipment and people began to notice his extraordinary skills in working with light and form. During the years just before his death Jim had embarked on a major photo-journalism project "to document the life-style of the Dene Elders along the Mackenzie Valley.” As a Dene he was easily accepted into the daily activities of the people living in these communities, they were at ease with his presence and this shows in his remarkable collection of photographs. Some of the negatives were damaged in the fire that killed Jim Jerome and it was only through careful treatment and restoration that they were saved. His photographs, a collection of more than 9000 negatives , are a unique record of traditional Dene activities on the land taken at a time when the north was rapidly changing. They show a way of life that has, thirty years later, largely disappeared from the Northwest Territories.